Chunky yarn is something I’ve not played around with a whole lot, but when I saw this variegated color at Michael’s last winter, I had to pick some up. However, It took almost a year to figure out that it was begging to be turned into a cowl. 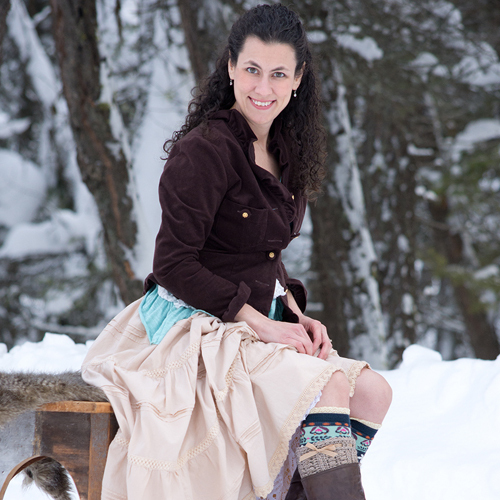 And not just any cowl, but a chunky cowl with hints of lace! 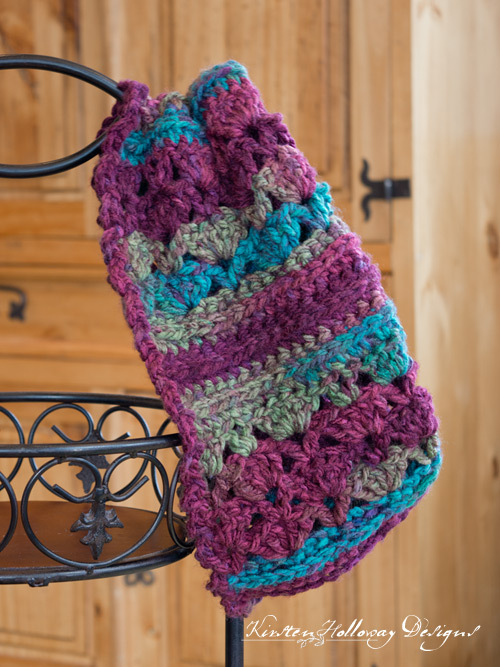 Because this crochet pattern uses chunky yarn, it works up so quickly, it is a perfect project to make for yourself! The soft yarn and rich colors make this a piece that will work year after year–classy elegance that never goes out of style. Have I mentioned how soft this yarn is? Really, treat yourself. You’re worth it! You will be working in rows for this pattern. I’ve written the “turn” after the chain, but you can turn immediately at the end of the row, and then chain the required amount, and still get the same results. You must be comfortable working in the 3rd loop of the hdc. Instructions: Look at the top of the stitch, and locate the sideways “V”, bend the stitch to look at the back, and you should see another “V”. You’ll be working into the back loop of that “V”, this is called the 3rd loop. Row 8: ch 3 (counts as first dc), turn, 2 dc in the ch 1 space of previous row, *skip over to V-stitch from previous row, 5 dc in the V-stitch, skip to center of 5 dc shell from previous row, V-stitch in the top of the shell* Put 3 dc in your final V-stitch (which is the ch 4 space) from row 7. Row 9: ch 4, turn, dc in very first stitch, *skip over to V-stitch, 5 dc in the the V-stitch from previous row, skip to center of 5 dc shell from previous row, V-stitch in the top of the shell* Your final V-stitch will be worked in the top of the ch 3 from previous row. Row 10: ch 3 (counts as first dc), turn, 2 dc in the ch 1 space of previous row, *skip 3 stitches, 5 dc in the V-stitch from previous row, skip to center of 5 dc shell from previous row, V-stitch in the top of the shell* Put 3 dc in your final V-stitch (ch 4 space) from row 9. Cut yarn leaving a tail that is about 18″ long. Use this tail to sew your ends together to make a tube. Attach yarn to one end of tube, *ch 3, sl st* around the edge. I left about a half inch between my slip stitches. Fasten off, and repeat on the other end of the tube. Fasten off, and weave in all ends. 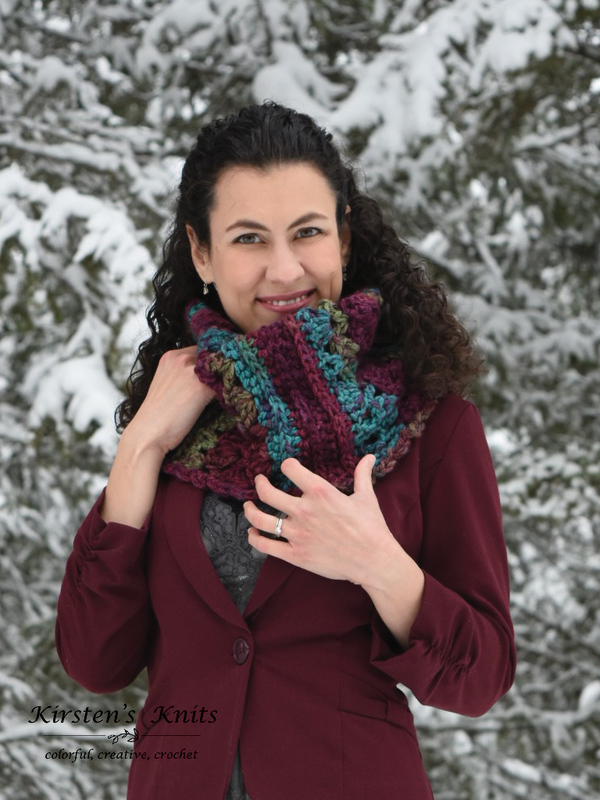 This cowl is featured by Elk Studio for their 2017 Make it for Me event. 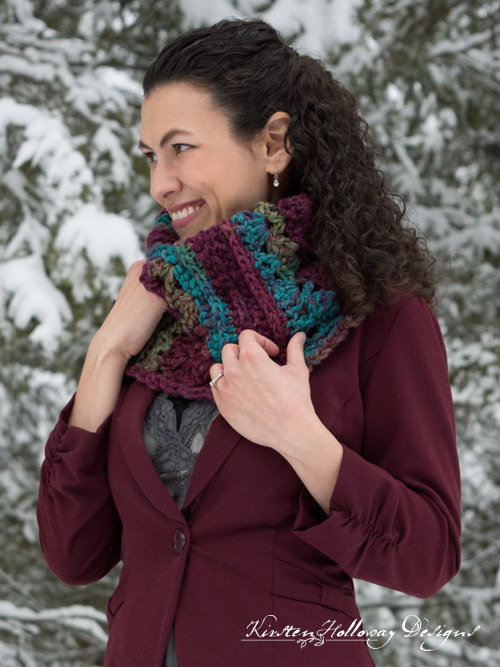 This chunky cowl pattern was made to be used by individuals, and small business crocheters alike. Selling your finished pieces in boutiques, at farmer’s markets, craft shows and other events is encouraged! The only thing I require is that it not be used commercially to produce millions of copies. You’re very welcome! I’m glad you like it! Hello, Kirsten! 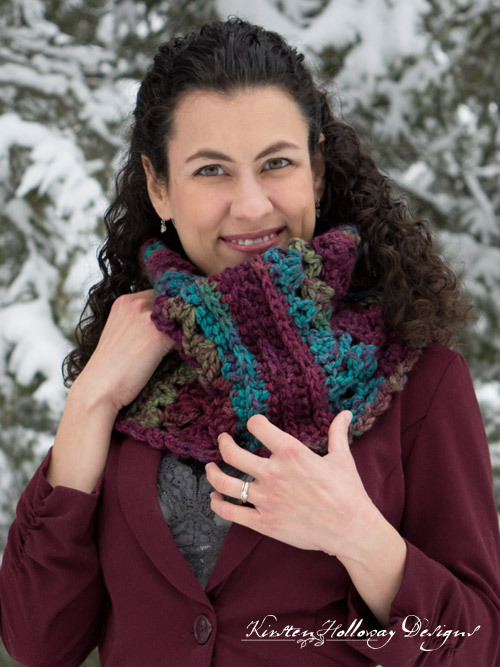 Thank you for the lovely cowl pattern. I was wondering if there are any instructions missing at the end of row 7 before row 8? How does row 7 end? Perhaps I am misunderstanding the pattern. I have worked through to row 9, but have had to pull it out twice because it doesn’t seem to match correctly. Can you help me with this section? I would greatly appreciate any explanation you can offer. Thank you so very much! Im sorry you’re having troubles with this! Row 7 should begin and end in a V-stitch (ch 4, dc in same stitch counts as a V-stitch), row 8 should begin and end in a 3 dc. You’ll alternate V stitches and shells so that you are always working a shell in a V-stitch, and a V-stitch in the 3rd stitch of your 5 dc shell (which is the center). Your rows that end with shells will only have 3 dc because they are half shells (to keep the rows going straight), so work your v-stitch in the very end (or beginning) of the shell depending on which end of the row you’re on. I hope that helps! Thank you so much – I am looking forward to wearing these beautiful colors woven into such a sweet pattern!